Did you know that an automatic dishwasher uses less hot water than doing dishes by hand, which equals an average of six gallons less per cycle, or more than 2,000 gallons per year? Considering that an individual American uses about 2,000 gallons of water per month, that’s a pretty significant number. The idea of “going green” has come a long way in recent decades. In the 1950s, some kinds of energy efficiency weren’t really a choice. From drying your clothes on a clothesline, to cutting your grass with a mechanical push mower, people often lived green without ever consciously considering their carbon footprint. These days, the story is a little different; you can’t turn a corner or pick something up without seeing some kind of “save the earth” signage or packaging. There are a plethora of reasons to go green, most falling into either the money-saving or the earth-saving categories. On one hand, you could seriously put some green back into your wallet with things like energy-efficient appliances, and green building tax credits and rebates. Also, simple things like carpooling, limiting eating out, and starting your own vegetable garden are great ways to save money and help the environment. On the other hand, eco-friendliness means making your community and the planet a better place to live not only for us, but also for future generations. Examples of things you can do in your home are unplugging unused electronics to prevent “phantom” energy consumption, switching to LED light bulbs, conserving water by taking shorter showers, and using reusable items like Tupperware and canvas shopping bags rather than plastic. With the Wink home automation ecosystem, you no longer have to “set it and forget it” when it comes to your home devices. You can control many of your smart devices from your couch, bed, work, or anywhere you are in the world. Here are just a handful of devices you can install in your home that will not only bring you into the 21st century, but also make your home a smoothly running, highly efficient machine. Thermostats are a great way to control your home’s energy consumption, and when you apply smart technology, you can control it from anywhere. 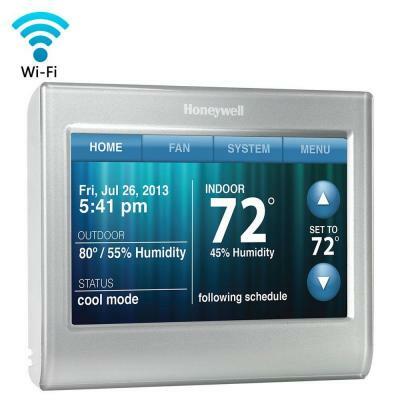 One Wink App Ready device is the Honeywell Wi-Fi Smart Thermostat, which not only adjusts to your schedule, uses automatic energy-saving settings, and Smart Response technology for precise temps, but also has a full-color, customizable screen to match your decorating scheme. You can be sure your home is aesthetically pleasing and at your exact desired temperature at all times. 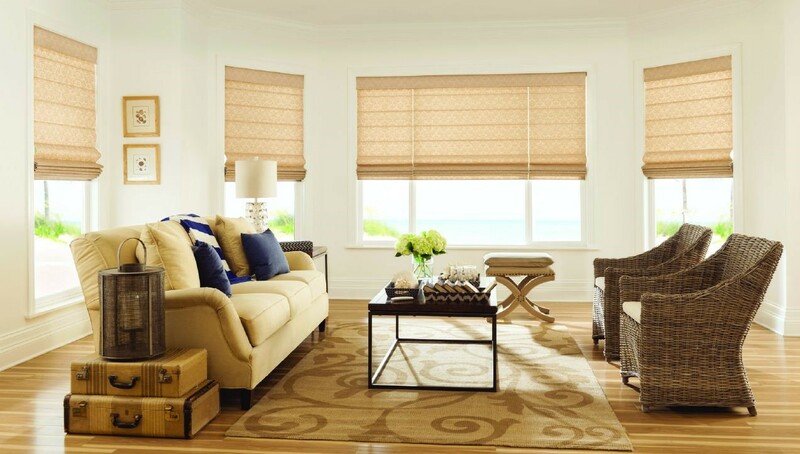 Motorized window shades allow for a clean, uncluttered look, are safer for pets and children with cordless technology, and help insulate your home with the setting of a timer or the push of a button. One quality option, Bali Custom Blinds and Shades with Somfy® automation & controls, utilizes a single control, wall switch, remote or programmable timer to operate single or multiple window coverings. Keep the shades drawn during summer to keep your home naturally cool, or leave them open in cooler months to let the sunshine warm your space. When it comes to eco-friendly new gadgets, it’s clear that home automation takes the cake. Having nearly complete control of your energy-consuming home devices right at your fingertips is certainly a big step forward for earth-conscious homeowners. 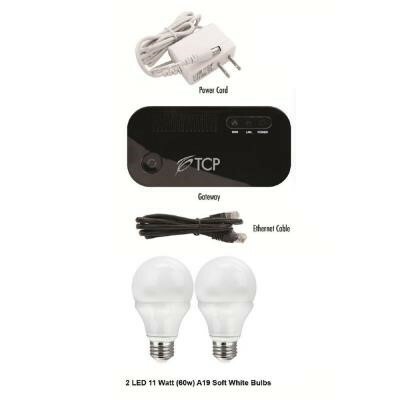 In addition to these devices, several other smart green products are energy sensors, HVAC systems, irrigation systems, and outlet controls. Which environmentally friendly automated devices will you install in your home? Three Percent Or 20 Percent – Which Is The Smarter Down Payment Strategy? The minimum down payment on an FHA loan is 3.5 percent, which makes it a popular choice among those who don’t have the funds for a large down payment (and also those who don’t meet the higher credit score requirements for other types of loans). And that’s not even the lowest you can go. Loans like this one require only three percent down, and if you’re a veteran or are buying a home in a rural area, you may be able to buy a home for nothing down. But should you go that low just because you can, or are you better off making a larger down payment? We’re breaking it down. Since the bank will generally consider you a lower risk because you have “more skin in the game,” you may be able to get a lower interest rate than you would with other types of loans—as long as you have the credit score to support it. You’ll have built-in equity as soon as you move in. You can avoid paying private mortgage insurance (PMI). 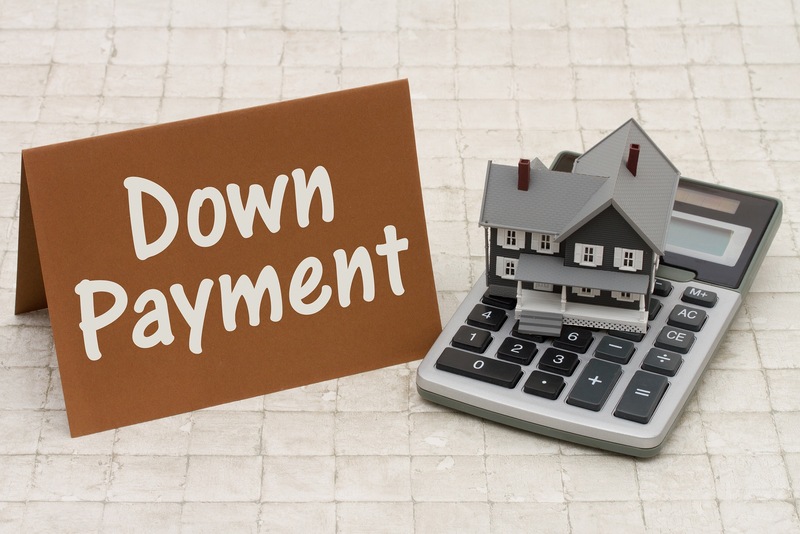 It’s that last part that drives a number of people to strive for that 20 percent down payment since PMI can add several hundred dollars to a new homeowner’s monthly payment, and it can be hard to get rid of it. “If you can put 20% down and avoid PMI, that is ideal, said certified financial planner Sophia Bera on Business Insider. The biggest roadblock to homeownership for many people is coming up with the down payment, so minimizing that expense sounds great, right? “The good news is a first-time buyer can purchase a home for a little as three percent down – and even no money down in some cases,” said U.S. News. But is that a smart move? Yep, there’s that pesky PMI again, which, for many first-time buyers, pushes their monthly payment to a level they’re not comfortable with. Another bummer about PMI: “If you need to pay PMI, the size loan you can get will be slightly smaller, to allow for the bigger payment,” they said. You may also have trouble qualifying for a loan even if you have a high enough credit score because you don’t have enough cash reserves; if you are using all your savings for the down payment and the lender questions where the funds for your closing costs, taxes and insurance, and any needed repairs are coming from, you could have a problem. But, on the flip side, a smaller down payment will up your rate of return, said The Mortgage Reports. “Consider a home which appreciates at the national average of near five percent. Today, your home is worth $400,000. In a year, it’s worth $420,000. Finding that balance between down payment and savings is a challenge for many homebuyers, and the sweet spot will be different for everyone depending on their unique circumstances and financial situation. Most financial experts will say that saving and scrounging to get together 20 percent at the risk of depleted savings and zero emergency funds is a shaky strategy, at best. “If putting 20 percent down means that you use all of your savings, then don’t do it! I would much rather see people put five percent down, wipe out all their other debt with cash, and still have three months of emergency savings versus putting 20 percent down on a house,” said Bera. Especially when you consider all the added costs you may be facing once you buy: “yard work, home repairs, renovation costs, property taxes, insurance, etc. It’s important to consider all of the costs and not just compare the monthly mortgage payment to your current rent amount,” she said. Another thing to consider when evaluating how much you should put down is what would happen if you had an emergency. It’s easy to lose sight of real-life issues that can arise when you are so driven to buy a home and focused on saving the money to get there. Congress is currently talking tax reform. Two very important real estate benefits are on the so-called “chopping block”, either to be completely eliminated or significantly curtailed. It is doubtful that the home owner exclusion of up to $500,000 (or $250,000 if you file a single tax return) of profit will be impacted; there are too many homeowner voters who will forcefully object. But investors do not have the same strong lobbyist who can make the case for preserving the “like kind” exchange. So if you have an investment property, now might be the time to consider doing an exchange. Residential homeowners have a number of tax benefits, the most important of which is the exclusion of up to $500,000 (or $250,000 if you file a single tax return) profit made on the sale of your principal residence. But real estate investors — large and small — still have to pay capital gains tax when they sell their investments. And since most investors depreciated their properties over a number of years, the capital gains tax can be quite large. There is a way of deferring payment of this tax, and it is known as a Like-Kind Exchange under Section 1031 of the Internal Revenue Code. In my opinion, these exchange provisions are still an important tool for any real estate investor. The exchange process is not a “tax free” device, although people refer to it as a “tax-free exchange.” It is also called a “Starker exchange” or a “deferred exchange.” It will not relieve you from the ultimate obligation to pay the capital gains tax. It will, however, allow you to defer paying that tax until you sell your last investment property — or you die. The rules are complex, but here is a general overview of the process. First, the property transferred (called by the IRS the “relinquished property”) and the exchange property (“replacement property”) must be “property held for productive use in trade, in business or for investment.” Neither property in this exchange can be your principal residence, unless you have abandoned it as your personal house. Second, there must be an exchange; the IRS wants to ensure that a transaction called an exchange is not really a sale and a subsequent purchase. Third, the replacement property must be of “like kind.” The courts have given a very broad definition to this concept. As a general rule, all real estate is considered “like kind” with all other real estate. Thus, a condominium unit can be swapped for an office building, a single family home for raw land, or a farm for commercial or industrial property. Once you meet these tests, it is important that you determine the tax consequences. If you do a like-kind exchange, your profit will be deferred until you sell the replacement property. However, it must be noted that the cost basis of the new property in most cases will be the basis of the old property. Discuss this with your accountant to determine whether the savings by using the like-kind exchange will make up for the lower cost basis on your new property. And discuss also whether you might be better off selling the property, biting the bullet and paying the tax, but not have to be a landlord again. The traditional, classic exchange (A and B swap properties) rarely works. Not everyone is able to find replacement property before they sell their own property. In a case involving a man named Mr. Starker, the court held that the exchange does not have to be simultaneous. Congress did not like this open-ended interpretation, and in 1984, two major limitations were imposed on the Starker (non-simultaneous) exchange. First, the replacement property must be identified before the 45th day after the day on which the original (relinquished) property is transferred. Second, the replacement property must be purchased no later than 180 days after the taxpayer transfers his original property, or the due date (with any extension) of the taxpayer’s return of the tax imposed for the year in which the transfer is made. These are very important time limitations, which should be noted on your calendar when you first enter into a 1031 exchange. In 1989, Congress added two additional technical restrictions. First, property in the United States cannot be exchanged for property outside the United States. Second, if property received in a like-kind exchange between related persons is disposed of within two years after the date of the last transfer, the original exchange will not qualify for non-recognition of gain. In May of 1991, the Internal Revenue Service adopted final regulations which clarified many of the issues. 1. Identification of the replacement property within 45 days. According to the IRS, the taxpayer may identify more than one property as replacement property. However, the maximum number of replacement properties that the taxpayer may identify is either three properties of any fair market value, or any larger number as long as their aggregate fair market value does not exceed 200% of the aggregate fair market value of all of the relinquished properties. 2. Who is the neutral party? Conceptually, the relinquished property is sold, and the sales proceeds are held in escrow by a neutral party, until the replacement property is obtained. Generally, an intermediary or escrow agent is involved in the transaction. 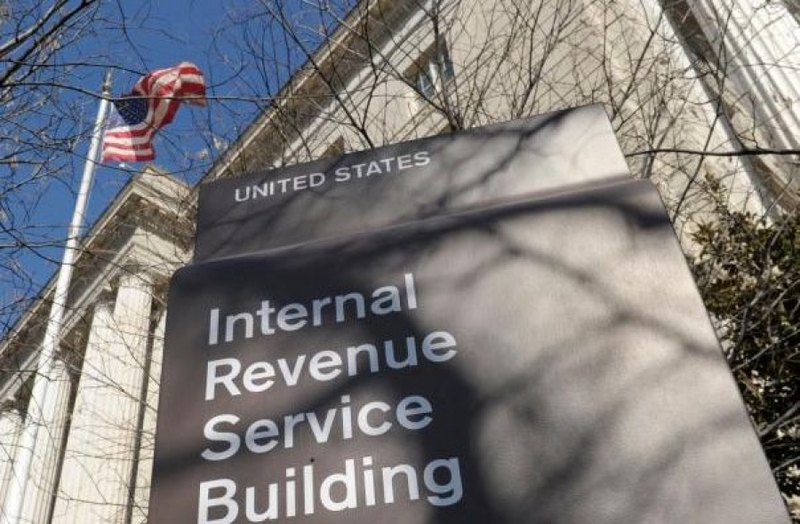 In order to make absolutely sure the taxpayer does not have control or access to these funds during this interim period, the IRS requires that this agent cannot be the taxpayer or a related party. The holder of the escrow account can be an attorney or a broker engaged primarily to facilitate the exchange. 3. Interest on the exchange proceeds. One of the underlying concepts of a successful 1031 exchange is the absolute requirement that not one penny of the sales proceeds be available to the seller of the relinquished property under any circumstances unless the transactions do not take place. Generally, the sales proceeds are placed in escrow with a neutral third party. Since these proceeds may not be used for the purchase of the replacement property for up to 180 days, the amount of interest earned can be significant — or at least it used to be until banks starting paying pennies on our savings accounts. Surprisingly, the Internal Revenue Service permitted the taxpayer to earn interest — referred to as “growth factor” — on these escrowed funds. Any such interest to the taxpayer has to be reported as earned income. Once the replacement property is obtained by the exchanger, the interest can either be used for the purchase of that property, or paid directly to the exchanger. The rules are quite complex, and you must seek both legal and tax accounting advice before you enter into any like-kind exchange transaction. The professionals at Position Realty can refer you to an intermediary who can help you facility your 1031 exchange. Still renting? You must have a good reason. Although, we’re not really sure what it is. With rents continuing to rise across the country, interest rates staying around historic levels, and new loans lowering down payment requirements, it just makes sense to take the leap to homeownership. Maybe you’ve got terrible credit and don’t want to take the time to improve it (or don’t know about loans that accept lower scores)? Or, maybe you just like giving your money away. If you’re still not on board, these 7 reasons might change your mind. GOBankingRates’ annual survey of “the cost of renting versus owning a home in all 50 states and the District of Columbia” just came out, and, while they “found that the number of places where it’s more expensive to own than rent has increased,” the number went from 9 to 11. That means that, in 39 states, it still makes more financial sense to buy. We’re spoiled. Seriously. Anyone who has been paying attention to the market over the last few years and has seen interest rates with a 3 or 4 before that decimal point may just think it’ll always be that way. But history has a way of repeating itself, and while we may not see rates in the teens again anytime soon, most industry experts have been predicting rates moving into the 5s sometime this year, with a pattern of rising rates beyond. Buying a home while money is cheap is a smart move. Rising rents may or may not equate to rising property values in your area, but either way, you’re not going see any financial benefit from it. When you own your home and your equity rises, that equity is yours. And so is the choice of what to do with it. 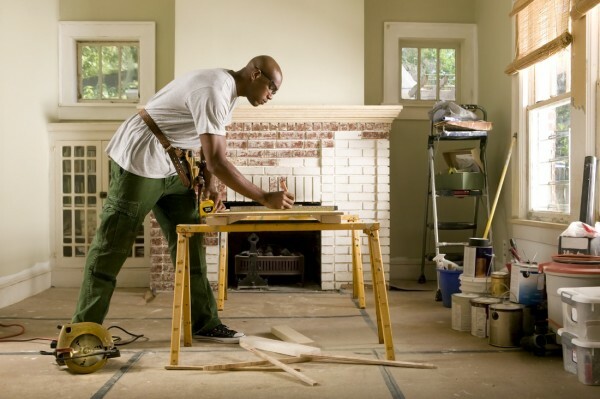 Whether you decide to let it sit and continue to grow or tap your equity for home improvement projects, the money is yours to decide how to use. Does 20 percent down make it more likely that you’ll qualify for a loan? Sure. Does that mean you have to come up with that huge chunk of money? No. Nor do you have to come up with 10 percent down, which, for some reason, the majority of new buyers seem to believe. “87% of first-time buyers think they need 10% or more down to buy a home,” said The Mortgage Reports. The FHA loan is one of the most popular loans available to first-time buyers because, not only can you qualify with a fair credit score, but the down payment is as low as 3.5 percent, and, “100 percent of the down payment can be a financial gift from a relative or approved non-profit,” they said. But, it’s not the only option for a low down payment. Fannie Mae’s Conventional 97 Mortgage and HomeReady Mortgage require just 3 percent down. The Mortgage Reports also has information on closing cost help and down payment assistance programs. When you own your home, your payment is your payment is your payment. Unless you take out a home equity loan or refinance to take cash out, your payment’s not going to go up. And think about it this way: Even if your house payment is going to be a little bit higher than what you’re currently paying in rent, it’s not an apples-to-apples comparison. How do those numbers look when you calculate the tax savings? 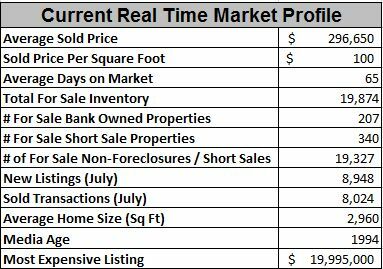 The current real time market profile shows there were approximately 8,948 new listings (down 1,231 listings from last month) on the market in July 2017 and 8,024 sold transactions (down 1,599 listings from last month). 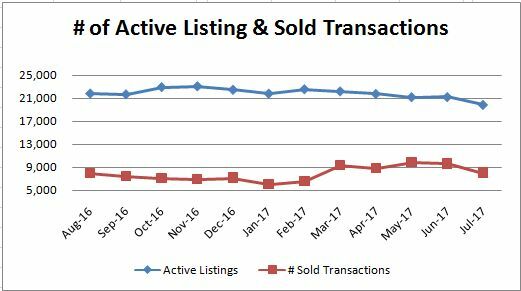 This is the first time in over a year the number of new listings exceeded the number of sold transactions. Overall, the inventory of homes on the market is still very low where in July 2017 there were 19,874 homes (down 1,365 listing from last month) on the market which is down -26.1% as compared to the number of home on the marker in July 2014. In July 2015 there were 22,129 homes, in July 2014 there were 26,906 homes and in July 2013 there were 19,724 homes for sale on the market. 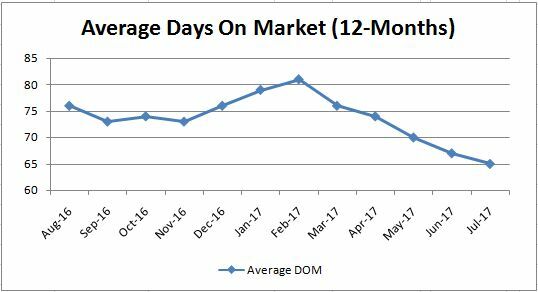 Due to the declining in average days on market since February 2017 this shows buyer’s demand is strong where inventories may continue to be low and drive up prices. The average sold price dropped from $304,678 in June to $296,650 in July which is a -2.6% decrease. 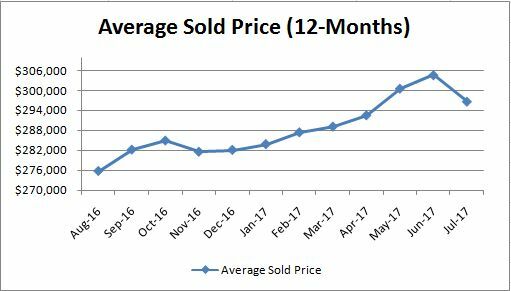 Historically since 2014 the average sold price has declined from July to August and doesn’t start to increase until late September and early October. Overall, the average sales price since August 2016 (12 months ago) still has an appreciation rate approximately 7.6% (down from last month) or from $275,642 in August 2016 to $296,650 in July 2017. In 2014 real estate prices only appreciated 4.5%, in 2015 5.5% and in 2016 4.2% where according to the National Association of Realtor the average annual appreciation rate is 5.4%. Therefore, Phoenix is still above the national appreciation rate. 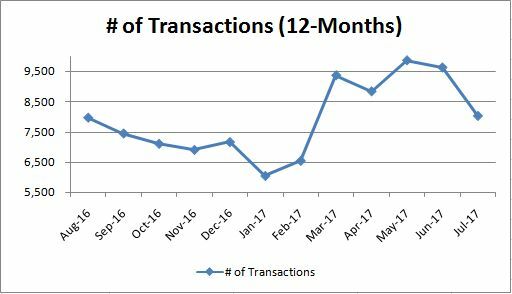 Since August 2016 (12 months ago), the average days on market has decreased approximately -14.5% (down from last month) and the number of sold transactions has increased approximately +0.8% (down from last month). 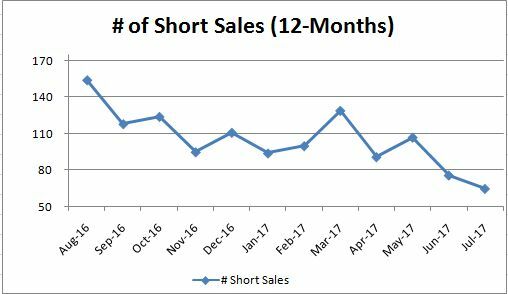 The volume of foreclosure purchases since August 2016 (12 months ago) has decreased approximately -42.2% and the volume of short sales decreased of approximately -57.8%. 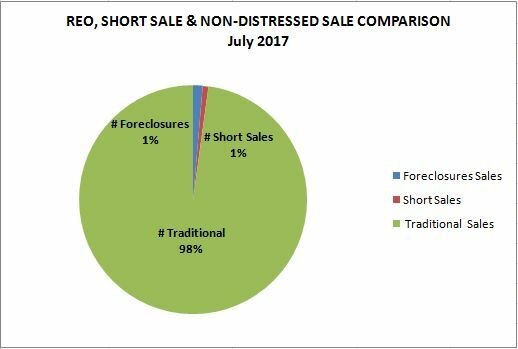 The current percentage of foreclosure sales and short sales sold is only 1% of the market which indicates a healthy market. 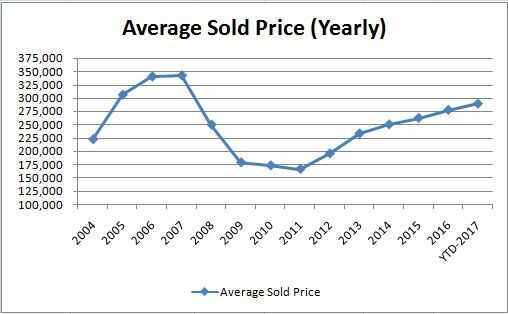 Unfortunately, there are still some homeowners who bought between 2005 and 2007 that are still up-side-down as shown in the yearly average sold price chart above. Since August 2016 (12 months ago), the number of homes for sale on the market have decreased approximately -9.1% or 21,873 homes for sale on the market to a gradual decrease of 19,874 homes (Down 1,365 homes from last month). The total number of listings is low as compared to 26,903 listings in July 2014. This decrease in the number of homes for sale indicates we are currently in a seller’s market (low supply and increased demand). Real estate prices will continue to increase and interest rates are planned to increase in 2017 so if you are thinking about buyer a home this year will be the time to buy before you get priced out of the market. Give us a call to discuss your best buying or selling strategy, TODAY!! Despite what you might think, it isn’t easy to spot a counterfeit check. Fraudsters know how to make a fake check look completely legitimate — so good that even a bank teller can’t spot it. That’s why fraudsters are using fake checks to commit all sorts of scams, including security deposits, phony prize awards, fake job offers, mystery shopper scams, and bogus online classified ad sales. Most victims are instructed to send the money via a wire transfer service, such as Western Union or MoneyGram. But some are told to buy prepaid debit cards or iTunes gift cards that they can use to buy things. When the bank discovers the check is counterfeit — which could be days or weeks later — that deposit is removed from the victim’s checking account. The crooks already have their money and the poor consumer is left holding the bag. Earlier this year, the Better Business Bureau released a list of the Top 10 Most Risky Scams based on an analysis of complaints collected through its online Scam Tracker. Fake check scams came in at number two, just behind home improvement scams. That ranking is based on how many people are targeted by the scam, how likely they are to fall for it and how much money the average victim loses. While anyone can fall for a fake check scam, the BBB’s analysis shows that men between the ages of 18 and 24 are the most susceptible. This is also the top scam for students, and military families and veterans. Fake checks are commonly used to steal money from people who want to become mystery shoppers. Kathy, who lives in Dallas, Texas, got taken for $2,650 this way. She asked that we not use her last name. Kathy had done mystery shopping before, so she wasn’t surprised to get an email from a mystery shopping company asking her to do some work for them. “The email seemed totally legit and everything on the website seemed on the up and up, so I didn’t question it. There were no warning signs,” she said. Kathy’s first assignment as a “survey agent” was to rate money transfer companies. The mystery shopper scammers sent her a check for $2,850 and emailed her a list of questions to fill out about her experiences. “It was a cashier’s check and it looked totally legit,” she said. Kathy was told to deposit the check, take the cash and go to three different money transfer services and wire $900 from each. That left her with $100 for doing the job. She did as instructed. About a week later, Kathy got a letter from her bank. It said the $2,850 check was counterfeit and couldn’t be cashed, so the money she had withdrawn would be debited from her checking account. “The bank should have been able to determine immediately whether the check was legit or not and they didn’t. And that really disturbed me,” she said. Kathy realizes she’ll never get that money back, but she hopes that by sharing her experience she can prevent others from becoming victims. Few of us understand how the banking system works and the scammers use that confusion to trick us. When we deposit a check, the financial institution is required by federal law to make the money available to us long before it can be certain the check is legitimate. We see the money show up in our account and assume the check is good and has cleared. Fake check scam victims frequently report that their financial institutions decline to help them. But that’s not what really happens. It may take a couple of days or a week or more for the check to work its way through the banking system and actually clear. During that time period, the bank gives us a short-term, no-interest loan using that check as collateral. If the check bounces, we have to pay back that loan in full. People who’ve lost money to fake check fraudsters frequently complain that their bank teller did not warn them about the scam and their financial institution would not help them when the check turned out to be bogus. Erika, a single mom in Oklahoma City who preferred not to be identified by her last name, was excited to be offered a work-at-home job this past spring. Her new employer sent her a check for $1,000 to buy office supplies and cover her first paycheck. Erika was told to cash the check at her bank, take $979 to another bank in town and deposit it into the account of a corporate vendor who would ship the supplies she needed to get started. A few days after she did that, Erika got a call from her bank. The check was a fake and there would be a $979 debit to her account. Not only that, but the debit caused her account to be overdrawn, which meant in addition to the $979 stolen by the scammers, she now owed the bank overdraft fees. “I’m looking for a job, so I can provide for my three year old son, and instead I get fleeced,” she said. Erika told NBC News she asked the bank if they could help her with this, but she was told there was nothing they could do. That’s not uncommon. Fake check scam victims frequently report that their financial institutions decline to help them. The nation’s bankers insist they take fake check fraud very seriously and are doing a better job of spotting it and stopping it. For example, the American Bankers Association said tellers are trained to say something and ask questions when they see a transaction that appears to be suspicious. That’s why it’s up to you to protect yourself and understand how scammers use fake checks to steal your money. The BBB’s Emma Fletcher told NBC News she cannot think of any legitimate business transaction where someone would send you a check, ask you to deposit it and wire back the money. “Any time you’re asked to do something like that, an alarm should go off that this is a scam,” she said. The Federal Trade Commission has information on Fake Check Scams and the Better Business Bureau provides 10 Steps to Avoid Scams. Landlords can sometimes get a bad rap for being ruthless, money-driven tyrants. The truth is, many landlords do a great job at keeping their tenants happy and, in return, reap the benefits of these people being taken care of. There is a downside for you as a landlord, though, and that occurs when you have not screened your tenants as well as you should have. Even with a proper screening, bad apples can occasionally sneak through, and that’s why it’s important to know the signs of a bad tenant. Read on for five red flags you need to look out for as a landlord. One of the most important things you can do is to call past landlords, as you want to know their history of payments, how they treated the rental property, etc. If the past landlord tells you there was an extensive history of late payments, damage done to the property, or, far worse, an eviction, this should be a giant “no” in your book. This is particularly true if these have been recent. If the bad behavior was far in the past and they have since had good reports, this is up to your discretion, but still be wary. Good Landlord 101 includes running a credit check, as knowing how (or if!) they pay their bills is key in deciding whether or not to let them live on your rental property. How landlords read credit reports is also crucial, so if you’re new to doing so, get some help from a company like TransUnion and do your research. Bad credit is a huge red flag and could indicate that they will have trouble paying their rent—tenant screening can save a huge headache. Of course, if the IRS can’t get money from them (hence the tax lien), how do you expect you will do the same? You definitely do not want a squatter! You are well within your rights to run a background check on your potential tenants. If your gut instinct tells you that this is a solid person and his or her credit check and references turn out okay, you might consider ignoring any minor offenses. However, someone with a major criminal history is obviously someone you don’t want living under your roof, especially if you have other renters in the vicinity. Your application should include a pretty extensive list of their past employers and how much they have made at each job. Long gaps in history could be an indication of flakiness and low income. You also want to be wary if they make very little money at their current jobs, as you have to weigh the rent vs. this amount of money. If it doesn’t seem to add up, it’s a red flag. Of course, you could ask that someone co-sign for them so that you have someone to recoup the money from him if you need to. That’s something that’s left to your discretion and many landlords will go with their intuition on this. Again, we can’t stress enough the importance of gut instinct. If the person seems overly nervous during the interview and can’t hold eye contact, it could be a red flag. What are they hiding? If there are gaps on their application and they can’t answer many questions during the interview, they could be hiding be a giant secret (or secrets!). Attempts at negotiation of monthly rent and/or deposit amount don’t have to be huge red flags, but they’re not great signs either. If you know your rental property is fairly priced, stick to that number. Negotiation could be a sign that they are not able to pay this amount on a regular basis. Why are renters leaving your units? What can you do about it? Tenants are on the move. What are the most common reasons they may leave your rentals? How can landlords prevent these moves to keep good tenants, maintain consistent cash flow, and maximize cash flow? 1. They want to move somewhere cheaper. Housing costs, especially rents, have been rising for the last five years. Some are just at the point where it makes sense to move somewhere cheaper where renters can get a lot more for their money. It could be that local rents have just gotten too high—or maybe your rents, in particular, are too high. Market rents change over time. Be sure you stay tuned into local trends, even when you aren’t actively looking for tenants. If neighboring properties are leasing for 30% less than yours, that could become an issue. Price your properties right. Invest in stable and upcoming locations with more room for growth. 2. They’re afraid of changes in the rental situation. Sometimes tenants leave just because they are afraid. They may be afraid of how much they think you are going to raise the rent when it comes time to renew. They could be afraid you are going to evict them because they’ve fallen a few days behind on rent a couple times. Or it could be that a tough new property manager you’ve brought in is causing panic in the renters. Set clear expectations. Get feedback from loyal, long-term renters you trust when you bring in new management, connect with them about renewing leases early, and maintain property upkeep to show tenants you’re a caring landlord, not a slumlord. 3. They need more space. Between a growing number of multigenerational households and Millennials’ growing families, many simply need more space today. A lot of people jumped on the minimalist lifestyle after 2008, but now, years later, they are tired of living so tightly and cramped. In fact, a Realtor.com survey shows that this is driving far more Millennials and Boomers to choose single family homes in the suburbs over homes in dense urban centers or condos. 4. They want to buy a home. With rents more expensive than mortgage costs in many areas, interest rates low, and credit scores recovering, many are making the leap to buy homes while it is still so attractive. If you can’t stop it, make the best of it. Ensure a good exit service. Return deposits and ask for a review on the spot. Still, if you can, get them to buy their home from you. 5. They don’t like the neighbors. No one likes scary or abusive neighbors—and they are out there. This is something to keep in mind when searching and screening rental properties. It is also important to keep lines of communication open and to listen to these complaints. If there are problem tenants in your own neighboring units, you probably won’t renew their leases. If they belong to another landlord, you may want to preempt issues by contacting the other landlord. There are a number of reasons good tenants can leave, even if they like the units they are in. Smart landlords will get out in front of these issues and find ways to keep those tenants in their property to avoid turnover costs. To many landlords, property management services are superfluous, cutting their profit margins to a minimum in exchange for basic services. But the reality is that property managers can make your life extraordinarily easier—and most charge a reasonable enough rate that you can draw a monthly profit from your properties (headache-free). However, when you’re searching for a property manager to handle your landlord responsibilities, it’s important to note that not all fee structures are the same. If you don’t understand how a manager’s fees work, you won’t be able to compare apples to apples, and you might end up shaving your profit more than necessary if you aren’t prepared for those fees when they come up. Many property managers will charge fees as a percentage of rent, but watch how this is worded—there’s a difference between charging as a percentage of rent due and a percentage of rent collected. A percentage of rent due means your company will charge you based on how much money a tenant owes you; a percentage of rent collected means your company will charge you based on how much money a tenant actually pays you—and is generally more favorable. If you’re charged based on rent due, you’ll end up paying for property management even when your property is vacant and you have no money coming in. You may also be charged an early cancellation fee should you break the contract with your property manager before the end of its outlined term. For example, if you agree to work with them for a year and you want out after eight months, you might pay an additional few hundred dollars. Be especially wary of this fee with untested property managers. “A la carte” management fees refer to a suite of extra fees a property manager may charge you in addition to basic services. Usually, a property manager will either charge a higher price (and no additional fees) or a lower price, with multiple additional fees, somewhat evening out. Accordingly, it pays to know what fees are applicable and what they might run you. The remaining items in this list could all be classified as a la carte management fees. If a company isn’t charging you the full cost of management while your property is vacant, there may still be an additional vacancy fee. Rather than collecting a percentage of rent due, they may collect a smaller amount from you as a kind of retainer. When it comes time to seek a new tenant, some property managers may charge you an additional advertising fee. This would cover the cost of creating media (such as taking photos) and placing it on sources like online listings or paper publications. A leasing fee may apply when you find a new tenant for your property. This covers the cost of drafting and securing a new lease agreement and is generally low in cost. If the cost here is high, it should raise a red flag, especially if your resulting tenant turnover seems to increase. Lease renewal is even simpler than initial leasing, but it may still require a fee. You may need to draw up new paperwork or renegotiate terms with a tenant, and that means your property managers will be doing a bit of extra work. Expect minimal fees here as well. Property management fees should cover basic instances of maintenance and repair, but some companies may charge extra for big jobs, or for an inspection between tenants. Eviction can be a messy process, and if you ever need to evict, you’ll be grateful you have a property management service in your corner. Most property managers will handle the eviction completely on your behalf, but some will charge you an extra fee for the extra work involved. Expect to pay at least a few hundred dollars for this process. Different companies might charge money in different ways, but if they’re offering similar services, you’ll likely find the bottom-line price of each to be competitive with one another. The big difference here is how you plan on using your property management company; for example, if you’re looking for long-term arrangements, an early cancellation fee shouldn’t factor much into your decision. Try to consider all these factors and all price points when comparing providers and making your decision.